As it’s been reported here and elsewhere, air pollution is quite literally the cause of many headaches in China. The smog is at historic and alarming levels, and there’s no respite in sight. But an even bigger health problem in China is tobacco use. There are as many as 350 million smokers in China, which is approximately 30 percent of the smokers worldwide. Tobacco use accounts for 12 percent of total deaths in China and the country produces about 2.3 trillion cigarettes annually, which is 40 percent of the world’s total. Simply put, China is the world’s largest producer and consumer of tobacco products. There have been many attempts by legislators in China to curb tobacco use, but nothing of note has come to fruition. How can China correct this ever-worsening problem? There are 1.2 million tobacco-related deaths annually, and by 2030, it is expected to be 3.5 million. One of the simplest ways to turn these numbers around is to create an environment conducive to education. Most Chinese smokers do not know the deleterious effects of smoking. After all, Chinese schools have advocated – and even linked academic performance with – tobacco use. There is little educational emphasis on preventing tobacco use, especially for children, and the tobacco culture is very strong in China. Smoking doesn’t have the same stigma as it does in the United States. There is no public shaming like smokers face in the West. In 1965, over 40 percent of the adult U.S. population used tobacco products; now, less than 20 percent does. That drastic reduction is attributable to educational and cultural changes, including better and larger labeling, limiting advertising, and the creation of organizations aimed at educating the public. Education and then building a new cultural awareness is the true key to reducing tobacco consumption. To combat tobacco use, China’s governance structure must be empowered to take effective action. For instance, China’s tobacco manufacturer, the China National Tobacco Corporation, is part of the State Tobacco Monopoly Administration, which itself handles tobacco control. In this perfectly mangled structure, a single ministry is responsible for both control and production. This is not only a massive conflict of interest, but it also conflates the problem. It can’t possibly do both things effectively. Instead, the focus is on one area while neglecting the other. Further, enforcement of existing regulations is lax. Despite being a party to the WHO Framework Convention on Tobacco Control (FCTC), China has failed to implement the FCTC’s provisions. While some cities have outlawed smoking indoors, these laws are often broken without consequences. No country-wide improvements can happen if the laws have no teeth to them. Because these laws aren’t part of the culture, the onus of enforcement falls on nonsmokers’ asserting their right to breathe clean air in public places. China has been remarkably unsuccessful at enforcing existing laws meant to control tobacco use. 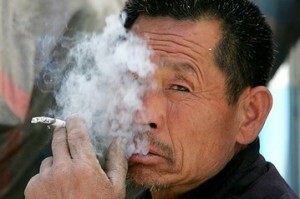 Because of this, the prevalence of smoking in China has not changed much over the past decade. If the government starts taking tobacco use seriously, the public will be forced to as well. The public isn’t going to be leading the charge – has to start at the government level, and China has to take a strong and firm step. Lastly, effective tobacco control in China requires an increase in prices. Because of subsidies, a pack of cigarettes can cost as little as 80 cents. With such low prices, there is no economic incentive for the public to stop smoking. Research has shown that cigarette prices are an important determinant in smoking in China. Cigarette demand is highly elastic and when tobacco prices increase, there will be a similar decrease in cigarette consumption. By using a cigarette excise tax, there will also be an increase in government revenue. For instance, a 10 percent price increase would result about a 5 percent reduction in tobacco consumption—it could be as high as 8 percent, but as low as 3 percent—while raising billions in revenue. Though raising the prices of such a widely supported item might be politically unpopular, the prospect of generating billions in additional revenue should soften the blow. Let’s be clear about the facts: China spends over $10 billion on tobacco-related health care costs. There is no redeeming quality of tobacco. It is already the leading cause of death in China and it’s impact will only grow based on the current trends. Creating stronger and better regulations and enforcing existing laws is the path to a more politically, economically, and physically healthy China. anyone of you know how many chinese teenagers will get lung disease in a year?